Every piece has it´s own story and the journey from white canvas to finish is never the same. Although I have a set goal each and every time I start, the subject often pushes me in different directions. It´s a constant dialogue and sometimes even a struggle, between myself, the paint and the canvas - and I love it. The figure or any living thing is my darling of subjects. Movement, balance, harmony, presense and sometimes stillness are pillars I try to convey with my work, whether I chose to work with oil , ink or clay. I treasure the freedom of choosing medium according to my mood. 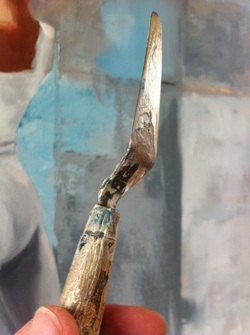 It´s the feeling the painting gives off as a result of feelings invested in it, that makes a painting worth gazing at. Never teqnique alone. Sometimes I have moments when I totally relax and trust in all the things I´ve learned and studied, over and over for years, and let the less controlling me take over. That´s the place where great things happen.